My research focuses on how artists’ create and construct communicative contexts within practice. Focusing on sound, my work observes human interaction and activates spoken-word, with original narratives being questioned and new, quasi-fictional narrative constructed/composed. Exploring ‘erasing’ as a methodology, my experimental approach takes the form of digital recordings where much of the content is deleted, leaving digital fragments or ‘traces’. These traces are then used to create and compose meanings. Sound can exist in isolation, separate from other sensory experiences. My interest is in this lack/trace of visual material and I see this assisting listeners to form their own meaning and interpretations as they listen – essentially they ‘become’ part of the work generating meaning from the ‘gaps’ I have left, based on their own personal experiences. How Does This Relate to The Scottish Crannog Centre? I’ve learned a few fascinating things so far during my time at the crannog centre. The first is that many of the objects that have been discovered at the Oakbank Crannog site are remnants or parts of objects that have either been discarded (thrown over the side of the crannog) or lost (dropped through the floor of the crannog). All of these objects collected on the lochbed and were preserved in the clay and debris of the loch. 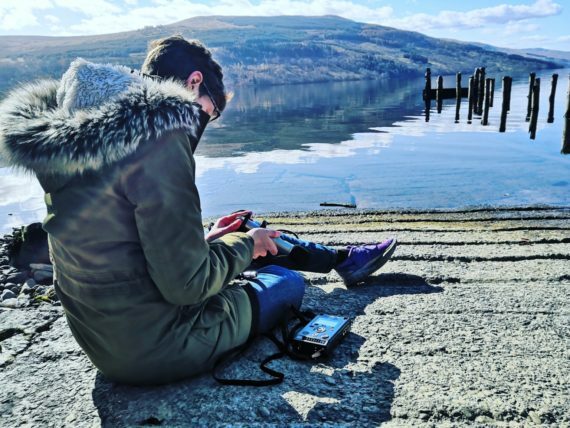 I see my use of ‘erasing as a creative method’ and ‘creating traces’ of language and/or sound as a way to further link my work with the above discovery at the Crannog. I also see this as a conceptual method that I can explore in the piece I will outline below. Narrative discusses object in question in the first person (I am) (eg. size, colour, texture, material, age, location, use or speculated use). Object is one from the Crannog Centre’s collection of discarded and lost objects. Narrative is repeated, with each repetition ‘deleting’ a word/words. Narrative is repeated until there is no spoken word/text left, silence. 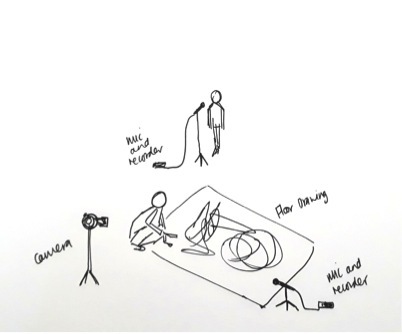 During narrative, performer is creating a visual representation of the object being discussed. Once drawing is complete, performer begins to erase drawing until there is nothing of the visual representation left. Performance is documented through digital sound, video and still photography. Kim Walker is a Scottish artist working with sound, video, installation and new media. 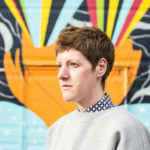 She gained her MFA in Studio from SAIC (School of the Art Institute of Chicago) and her BA (Hons) Time Based Art from DJCAD (Duncan of Jordanstone College of Art and Design). Through my art practice, I seek to understand pathos, our personal experiences and how we interact with rules and each other. I am interested in the intimate spaces we create that exist between human beings, such as temporary spaces that exist when we play games. My work explores spoken and unspoken words, intakes of breath, reactions to specific experiences and situations, internalisation of thoughts and what we choose to present of ourselves to the outside world.